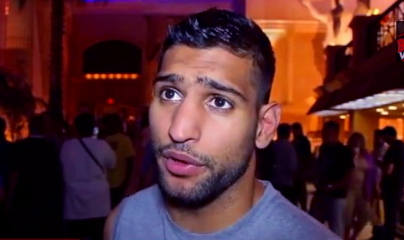 By Scott Gilfoid: Amir Khan (28-3, 19 KO’s) is hoping to fight Floyd Mayweather Jr. (44-0. 26 KO’s) in the UK in 2014 if both of them win their next fights. Khan is supposed to fight IBF welterweight champion Devon Alexander on December 7th, and Mayweather battles Saul “Canelo” Alvarez this Saturday night. If both guys emerge as victorious in these two fights, we could see Khan and Mayweather fighting next year in England. Khan has been yapping about wanting to fight Mayweather for ages now, and it’ll be good if the two can fight just so that Khan will quit talking about the fight all the time. The problem is that Khan will have to beat Alexander for this to happen, and I don’t think Khan is capable of beating Alexander unless he suffers hand problems like he did in his last bout against British fighter Lee Purdy last May. Alexander could still knock Khan out long before his hands start giving him problems, so I don’t even think hand problems would keep Alexander from ruining cans grand vision of fighting Mayweather. Here’s the deal; I don’t think Mayweather is going to be open to the idea of fighting Khan in the UK. We saw Khan win a controversial 12 round unanimous decision over Julio Diaz in London last April in a fight that Khan appeared to lose. We saw British heavyweight Dereck Chisora stop American Malik Scott by a controversial 6th round stoppage in London recently. And now we just saw Scottish fighter Ricky Burns get a controversial 12 round draw against Raymundo Beltran in Scotland in a fight that Beltran dominated him completely. Do you really think Mayweather is going to want to travel to the UK and risk getting royally jobbed over there? I don’t see it happening. Mayweather is likely want the fight to take place in Las Vegas, Nevada at the MGM Grand.